Kate Ellen is the love of my life (well a close second to Jennifer). She fills my heart with joy every day and continues to remind me of the person who had a big influence in my life – My Aunt Ellen. Jennifer and I decided to give Kate the middle name “Ellen” after Aunt Ellen because she was such a great influence on my life. “Ellen (Aunt Ellen as I knew her) was love. Unconditional love. She opened up her home, her heart, her kitchen, and her laughter to to anyone who was lucky enough to cross paths with her. She had a laugh that was engaging and infectious, a smile that was hard to miss, and a unyielding energy that was contagious. For my family, she was the center of the Universe. She was always there to offer food, beds, love, and laughter. Ellen would spend all day cooking in anticipation of our arrival. There was always conversation around the dining room table that lasted until bedtime. When I was old enough to travel without my parents, Aunt Ellen became my surrogate during the many trips to new york to see the ball drop or simply show my friends the city. Friends were treated better than family, often resulting in return visits and future follow up questions from Aunt Ellen about each temporary inhabitant that were now officially part of Aunt Ellen’s circle of love. Aunt Ellen had a dog, Heidi. Heidi and Aunt Ellen were the perfect match. Heidi would greet guests with the same unconditional love, excitement, and anticipation…until you wanted to give Aunt Ellen a hug or a kiss. As far as heidi was concerned, Aunt Ellen was hers and not to be shared with others. Heidi would growl, bark, or simply get in between the person attempting to show affection to Aunt Ellen. Heidi knew when Aunt Ellen was a mile away from the house. Heidi slept right next to aunt ellen in bed and never left her side. Heidi was a true reflection of Aunt Ellen – always anticipating the arrival of guests with unconditional love and affection. My favorite memories of Aunt Ellen always include her laughter. She always got the joke and always continued the laughter with more jokes or stories. She always stayed up late into the evening when there were guests around…in fact, I don’t ever remember her going to bed before anyone else. She loved being around other people and anyone who was lucky enough to be a guest in her house felt something missing from their lives upon departure. Today is Aunt Ellen’s birthday and I can’t help but think how seeing Kate would have brought joy to her heart. Every time I look at Kate, I am reminded of how lucky I was to have known Aunt Ellen. 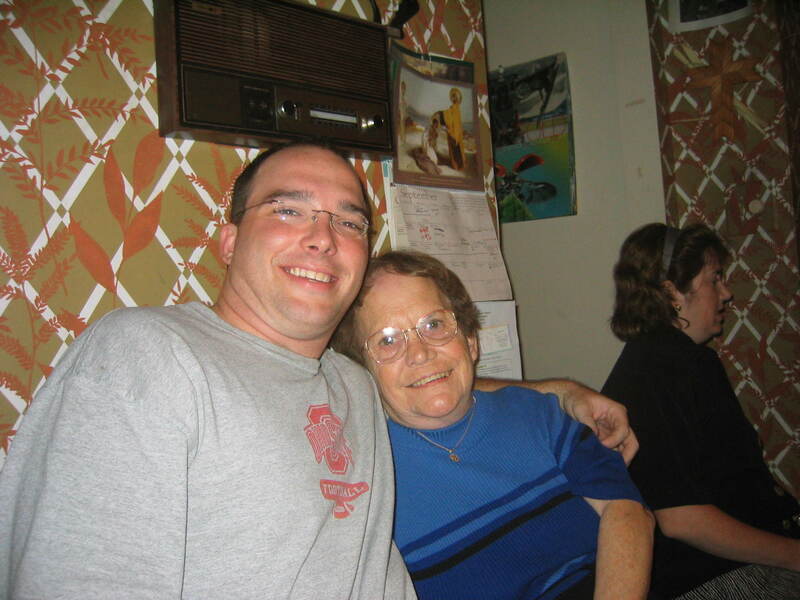 Although Ellen was always “My Aunt Ellen”, she was also a mother, grandmother, nurse, and friend to others. Maggie Stine, who is Aunt Ellen’s granddaughter has put together a very touching video montage with pictures and video – you can find the video on Jason Henriques’ blog (Jason is Maggie’s fiance). Click here to see the video – turn up the sound! This entry was written by John, posted on January 21, 2009 at 3:53 pm, and filed under Uncategorized.